This is free invoice template / free invoice form is designed with the special requirements of newsletter publishing business in mind. 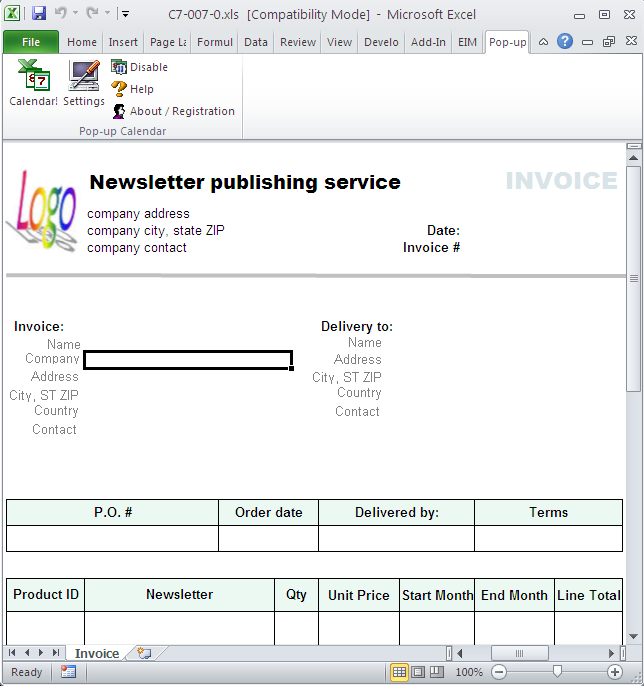 The invoice documents includes not only the usual fields required by an invoice form, such as invoice ID, invoice date, customer ("Bill To" section) and Ship To (Delivery To) section, but also the fields for newsletter subscription details, such as the start month and end month of each subscription. The printed invoice document will not include the content outside the "print area". This is implemented by creating the "print area" range name in Excel. With this range name created, Excel prints only the specified area. Since this invoice template is in Excel format, you can adjust various print options on the Page Setup dialog box in Excel, such as page scaling, page margins, page header and page footer, print area and print titles - all Excel print tools are available to you. If you prefer, you can also install Microsoft or third party free add-in program for creating PDF format invoices. There are a number of formulas set to calculate figures such as line total, subtotal, and balance due. Since our free invoice templates are not protected by password, you can easily unprotect the invoice form to make adjustments to it. You can easily use this free invoice template as a start point to create your own invoice format, including using your own logo image, color style, font. On the bottom of the free invoice form there are spaces leaved for you to put description of your service, terms, or even bank account. The advantage of using an Excel-based invoice creator is that all the powerful Excel tools are available to you, from printing to formatting.